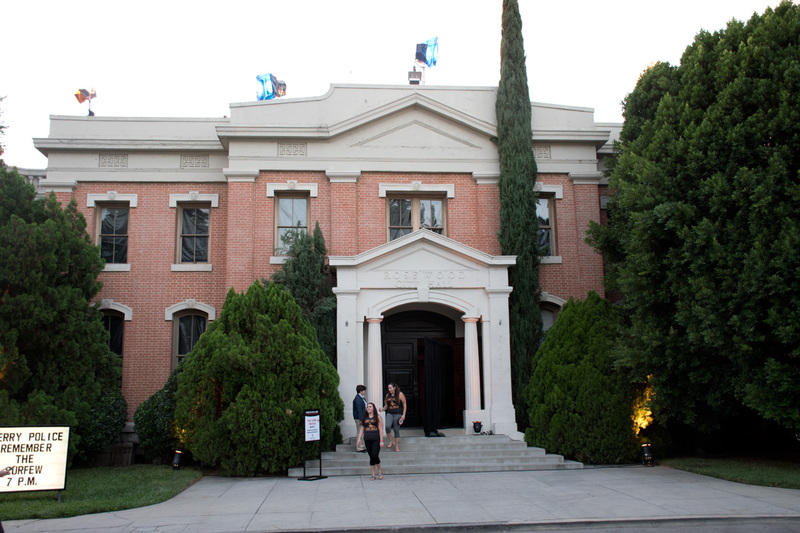 The Warner Bros. 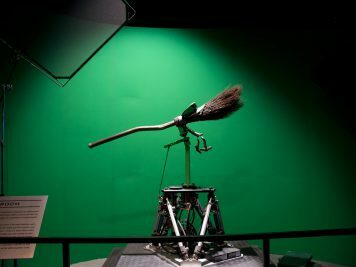 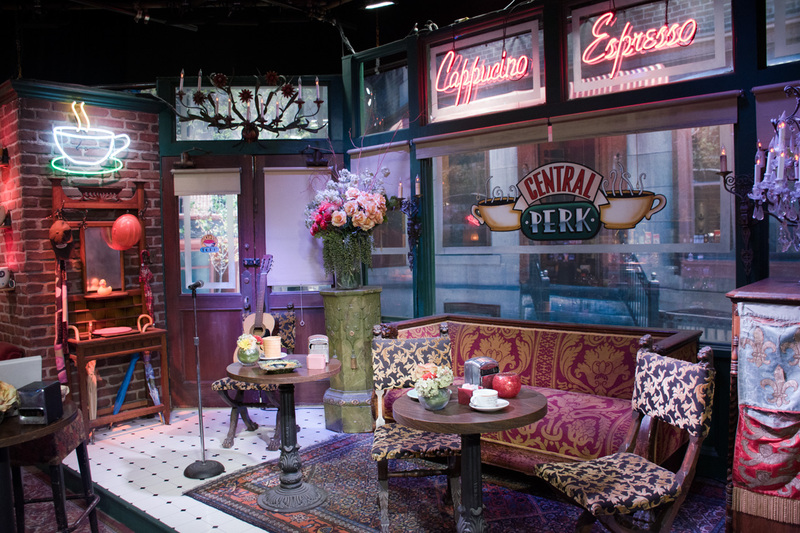 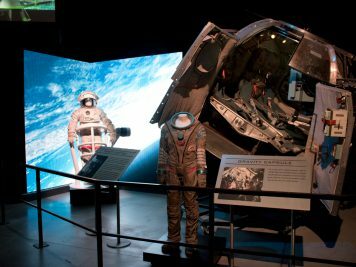 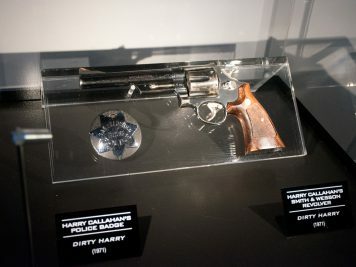 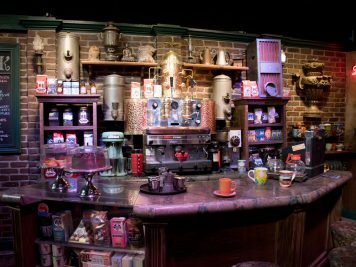 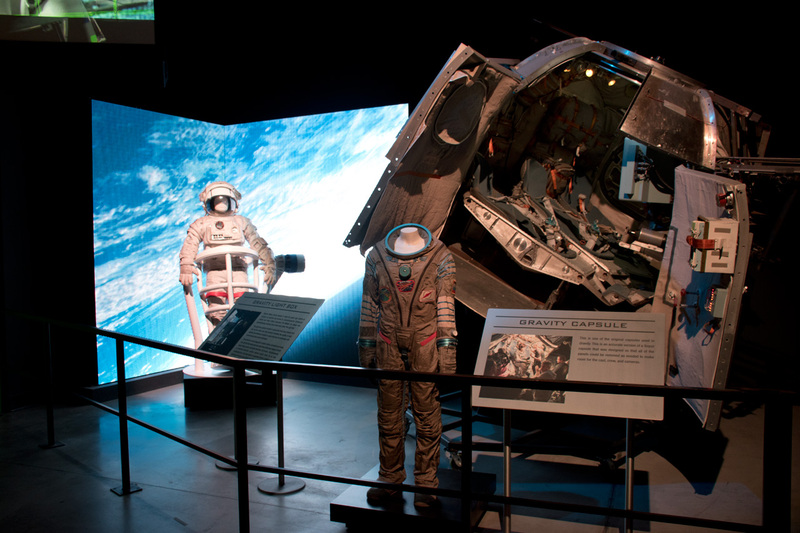 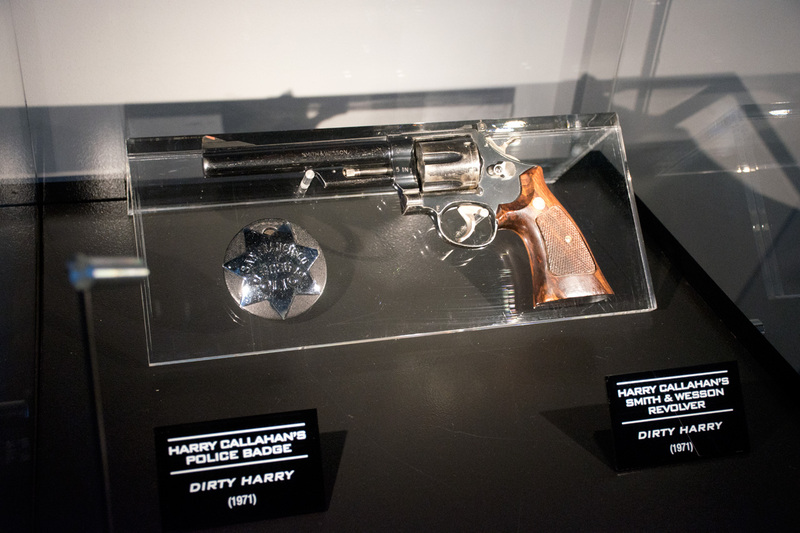 Studio Tour is one of the coolest things that a fan of film can book a trip on in the entirety of Southern California. 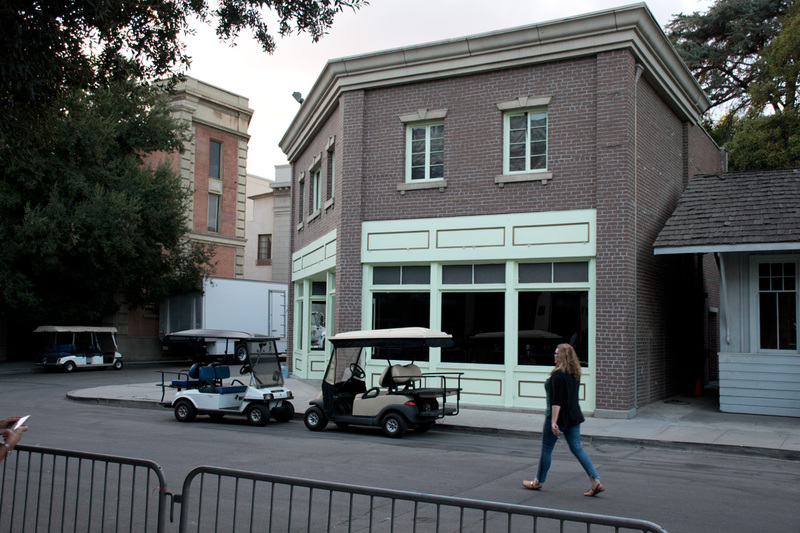 The amount of movie and TV filming locations on the lot is staggering and cannot be seen in just one ride on the two hour tour. 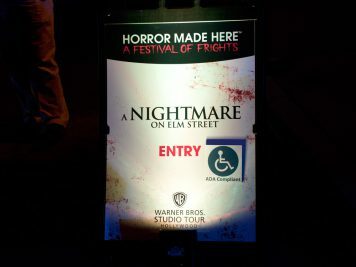 Getting into the Halloween season, Warner Bros. announced the “Horror Made Here: Festival of Frights” event. 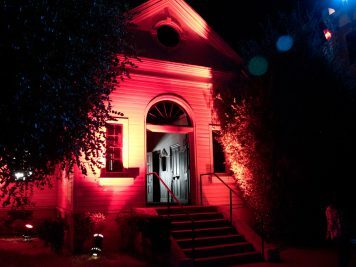 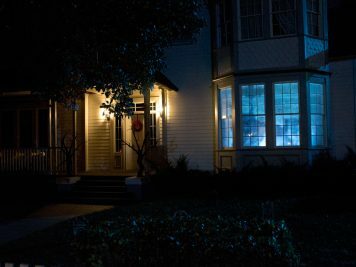 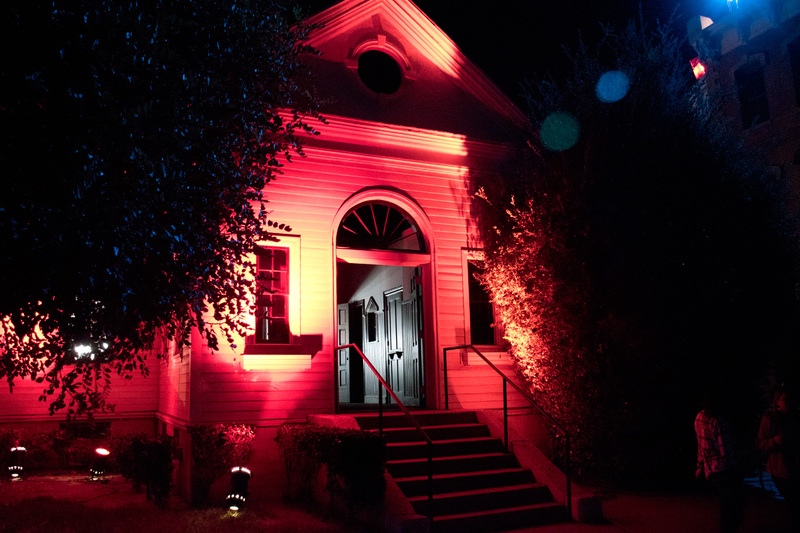 This small haunt takes place on only a handful of nights in October and sees roughly 1,000 people each evening. 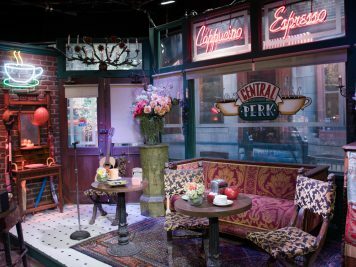 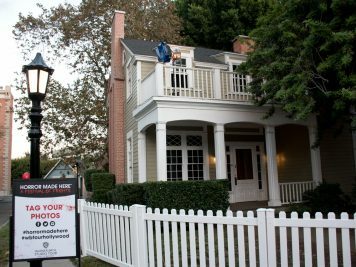 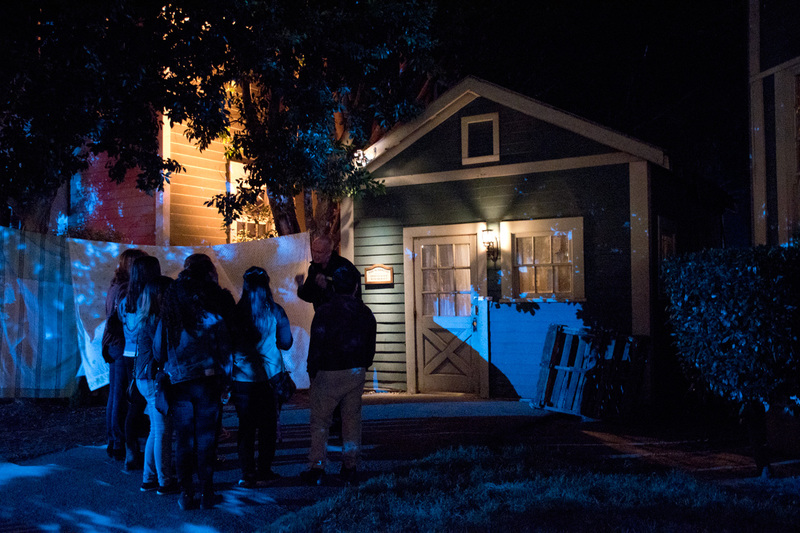 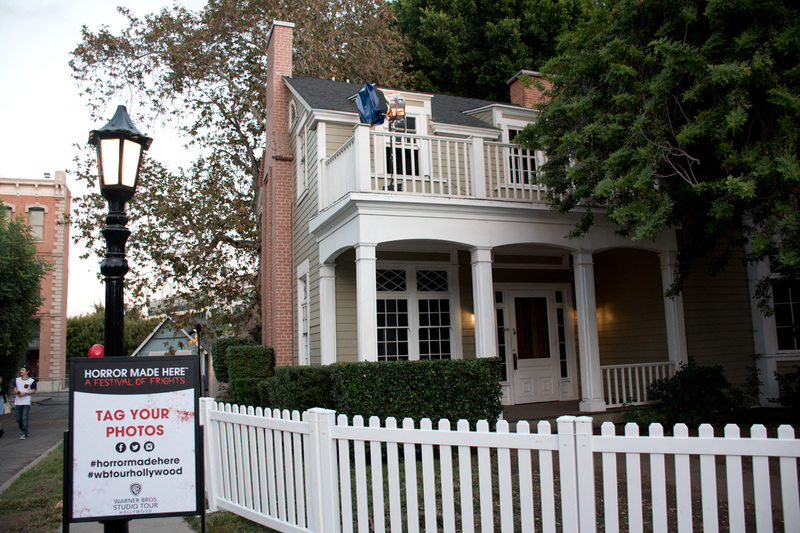 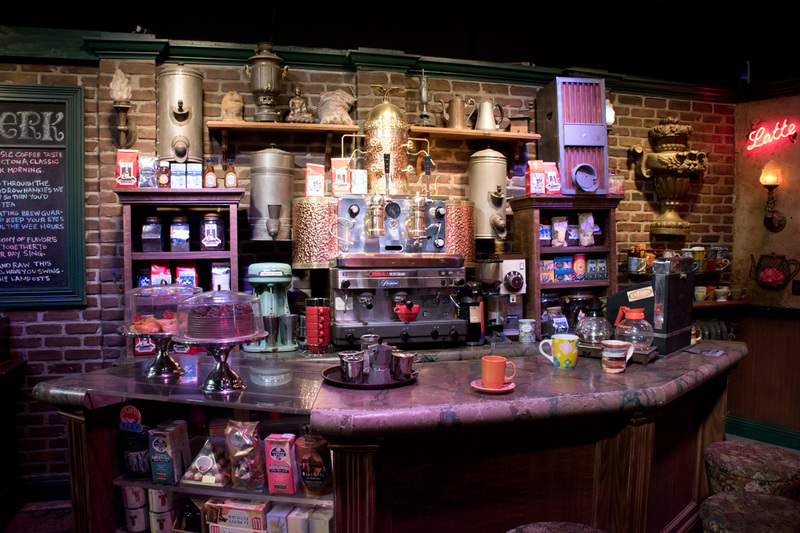 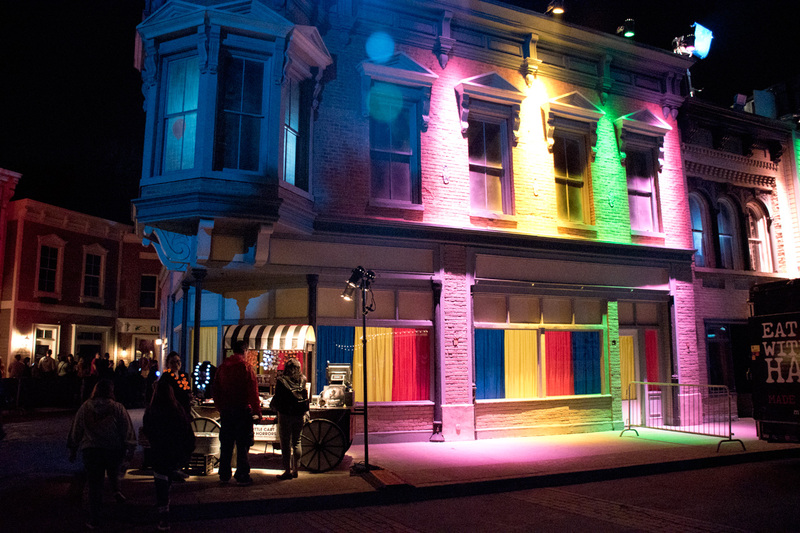 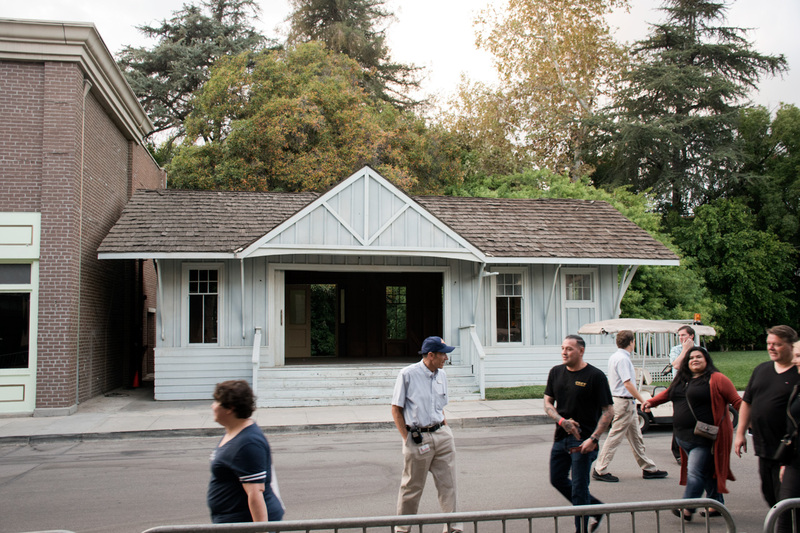 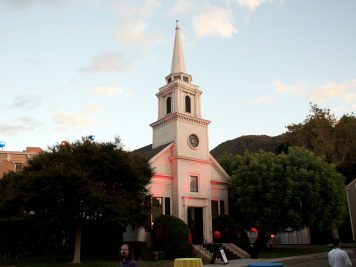 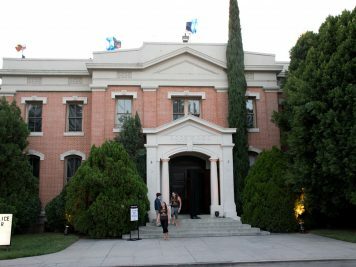 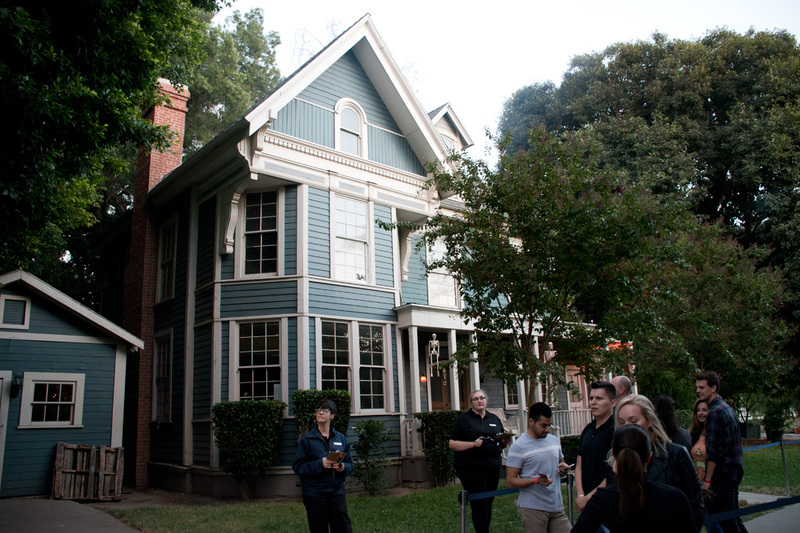 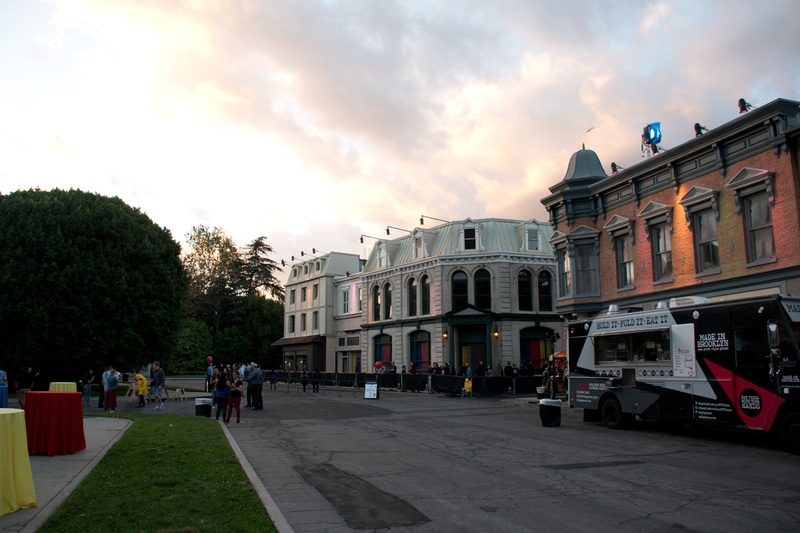 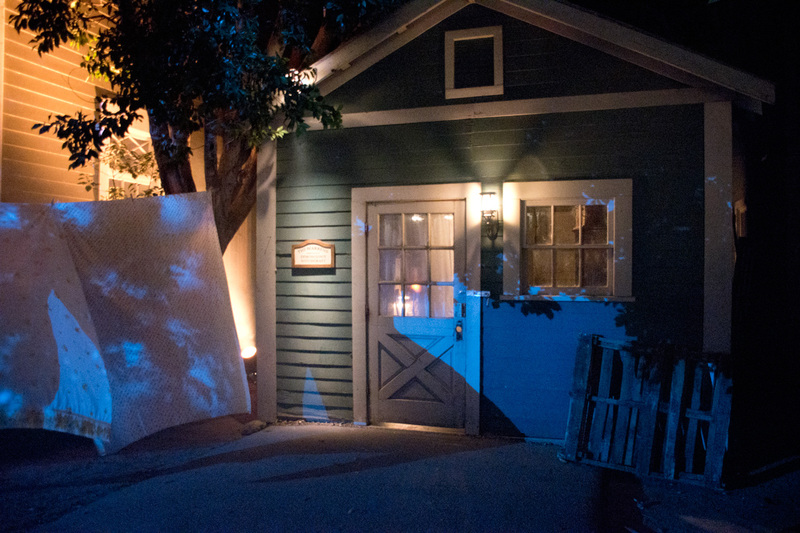 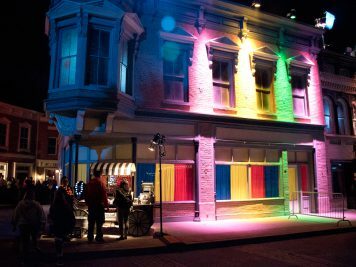 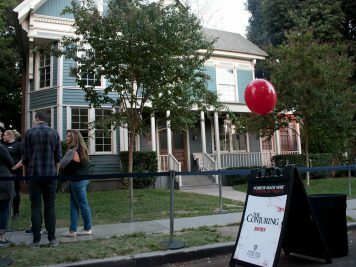 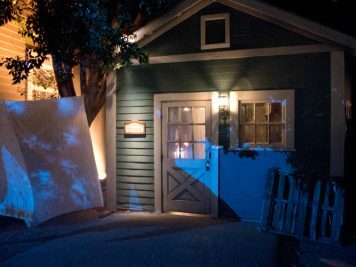 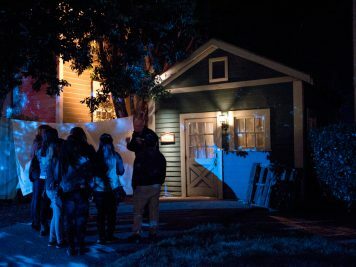 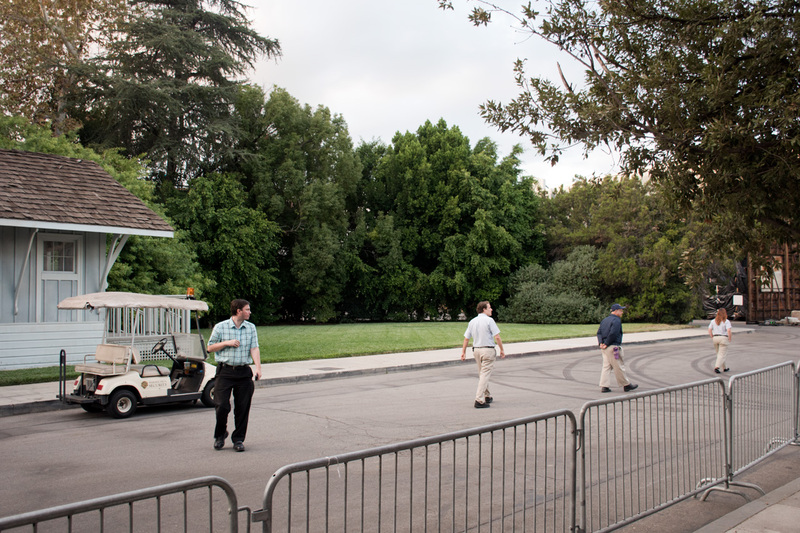 During the hours of 6pm to 11pm, guests can explore the town square area of the studio lot, where shows like Gilmore Girls, Pretty Little Liars, Growing Pains, True Blood, and a whole lot more were filmed. 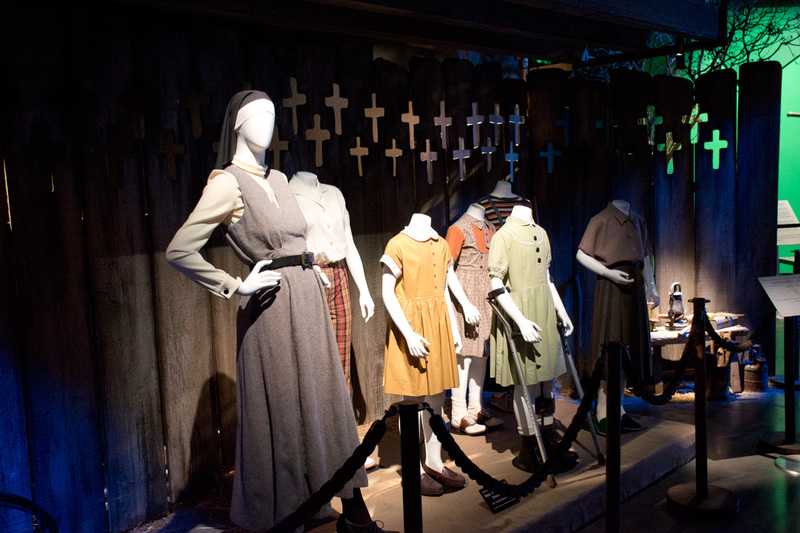 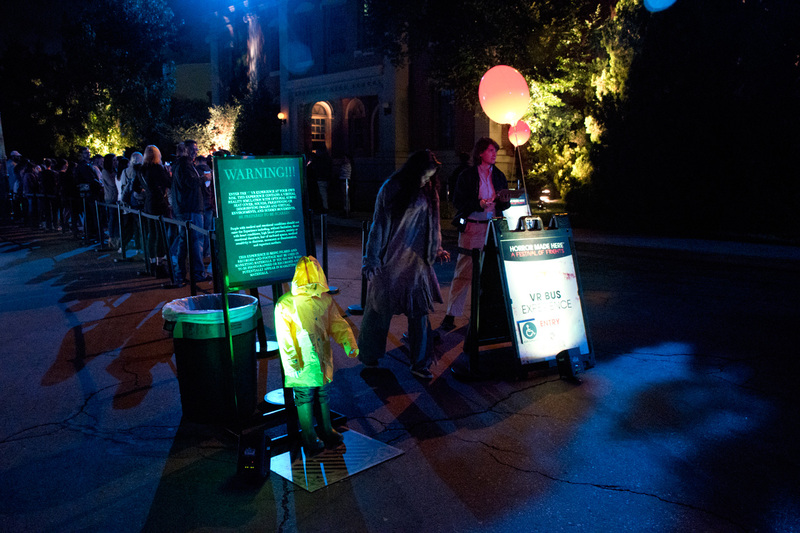 Guests are also invited to climb aboard an abbreviated studio tour as well as a number of small mini-haunts scattered throughout the grounds. 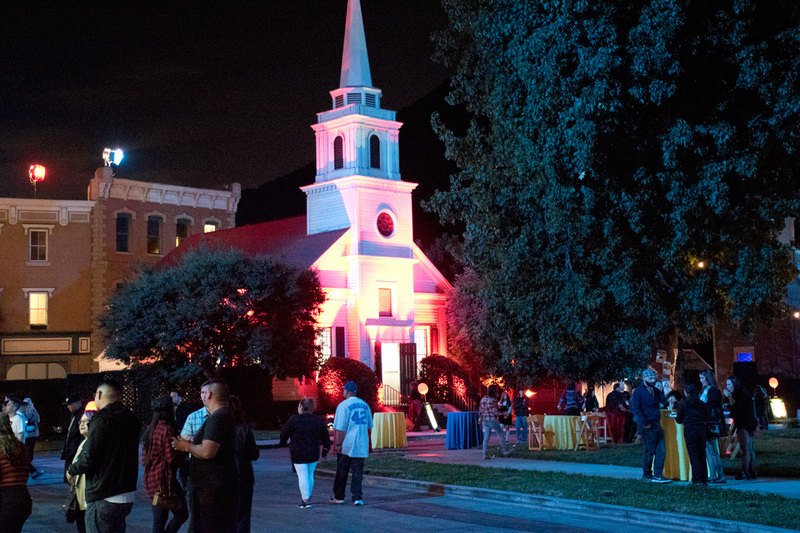 Attendees can also enjoy photo ops, a live DJ, drinks, and food trucks. 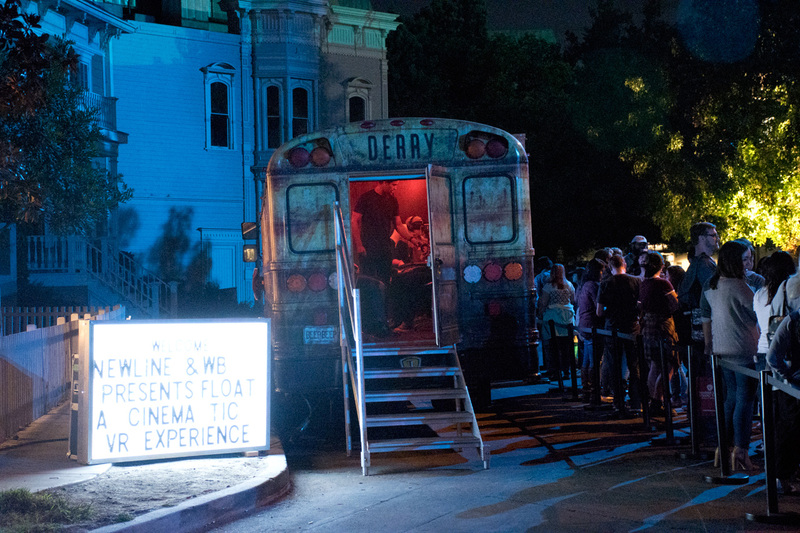 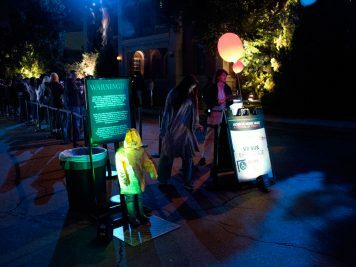 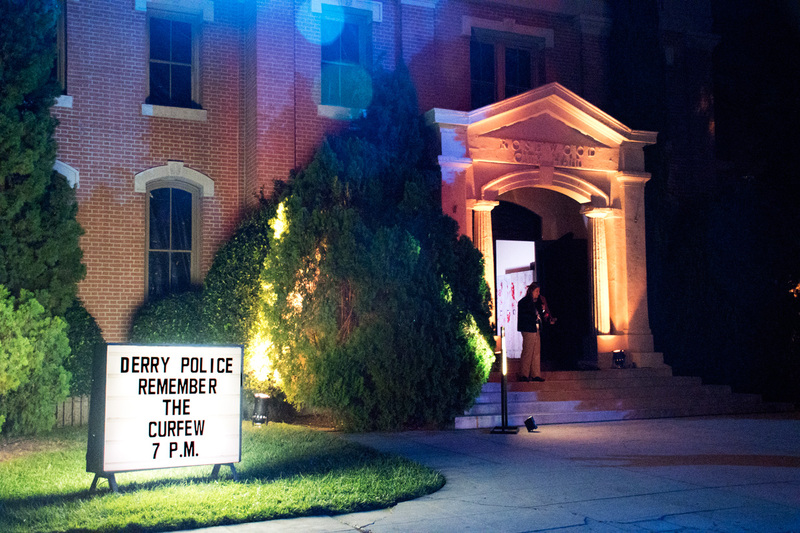 Horror Made Here: Festival of Frights features several small haunted house like experiences for guests to enjoy. 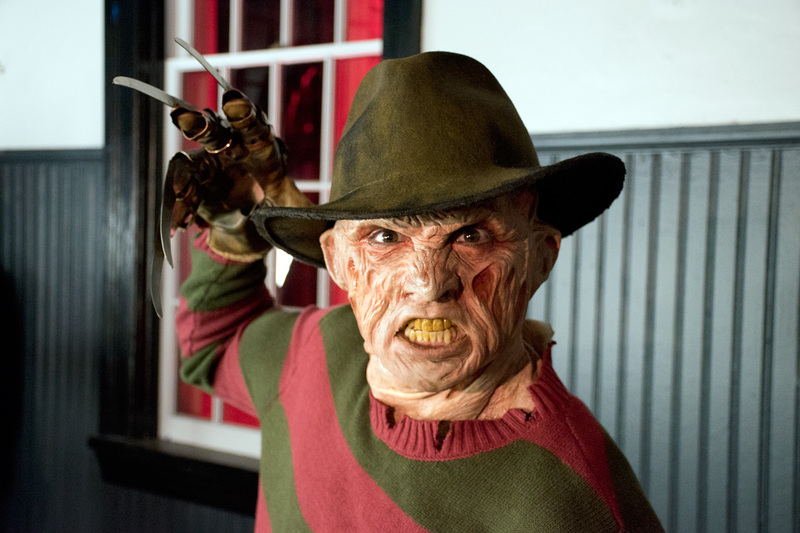 A Nightmare on Elm Street Haunted High School was a brief walkthrough of Springwood High, with hallways littered in teen corpses as well as the nightmare-stalking Freddy Kruger. 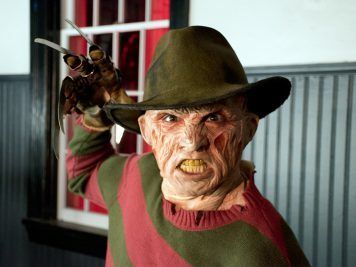 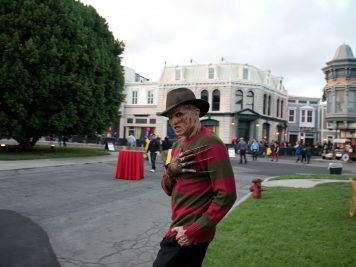 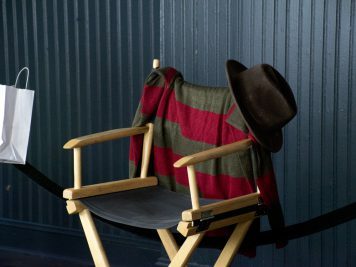 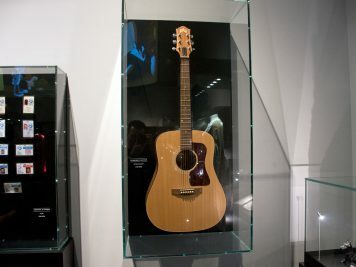 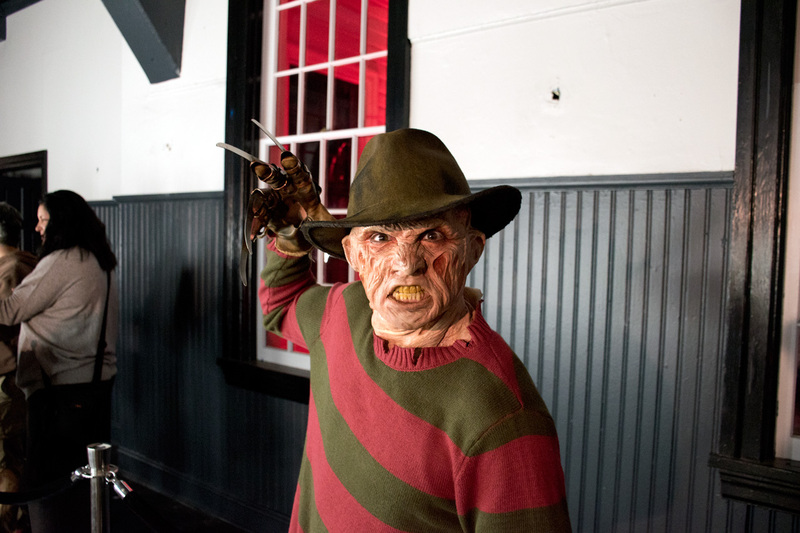 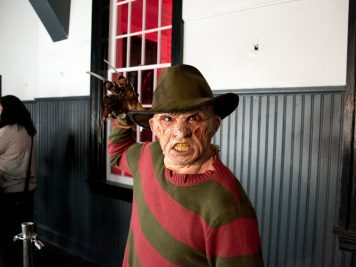 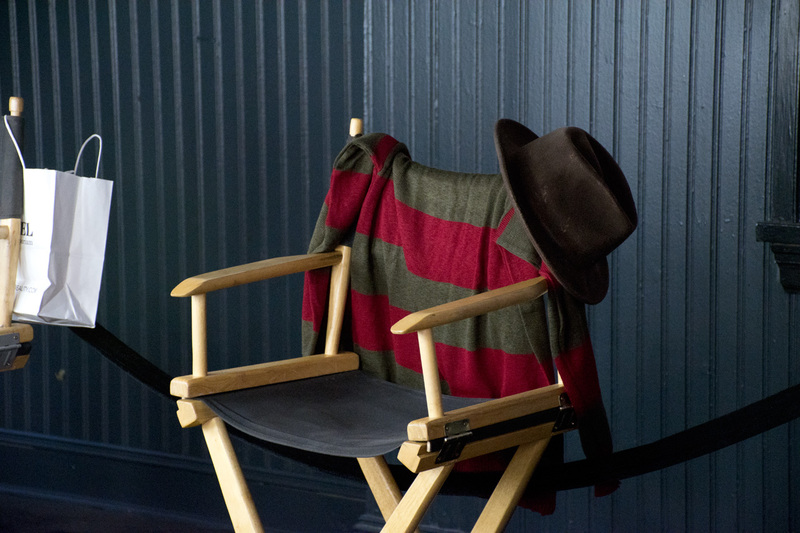 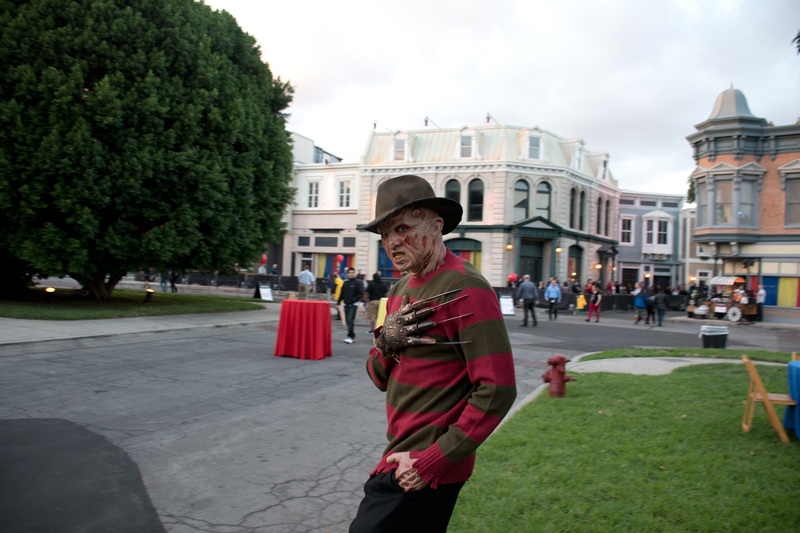 The experience was very short, but featured some great Freddy Krueger makeup prosthetics – most based on mold from the real prosthetic pieces used in the films. 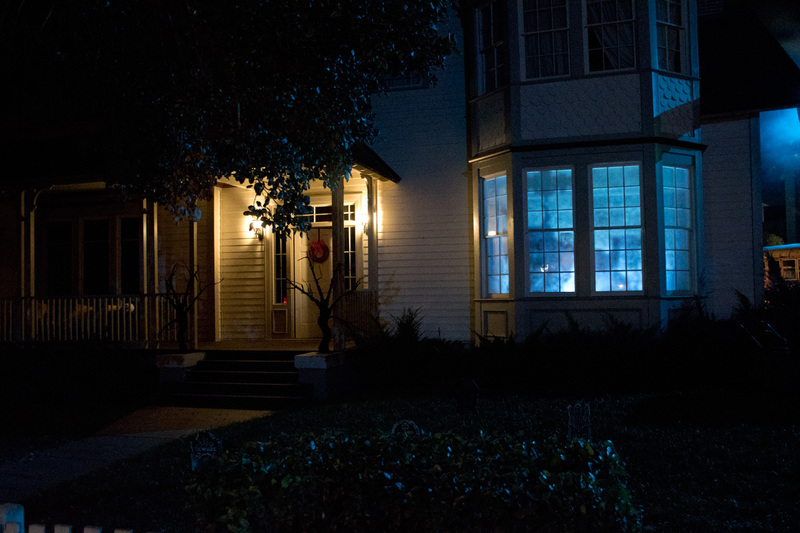 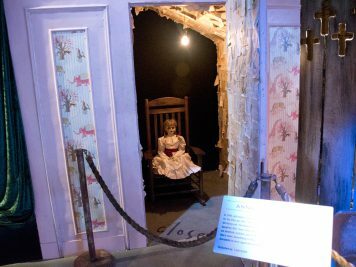 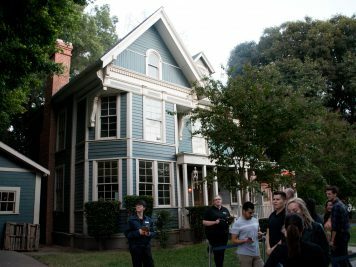 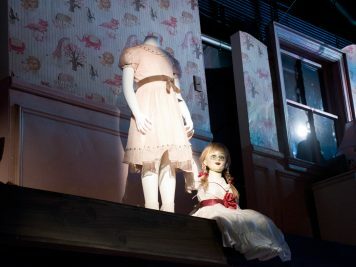 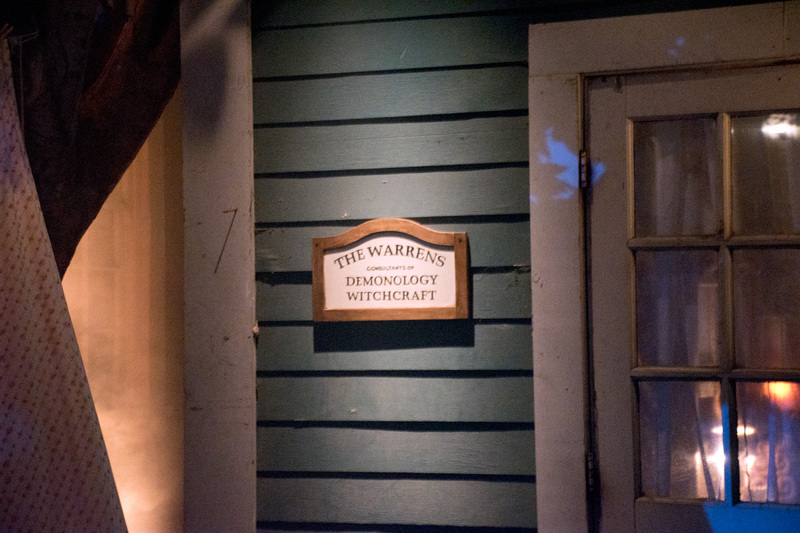 The Conjuring mini-haunted house is one of the gems here on the lot, taking place right next to the house used as the exterior home of Ed and Loraine Warren in The Conjuring and Annabelle films. 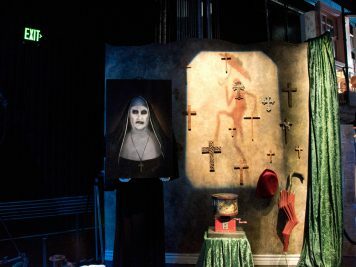 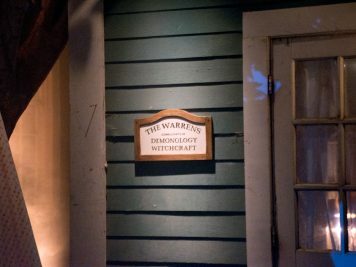 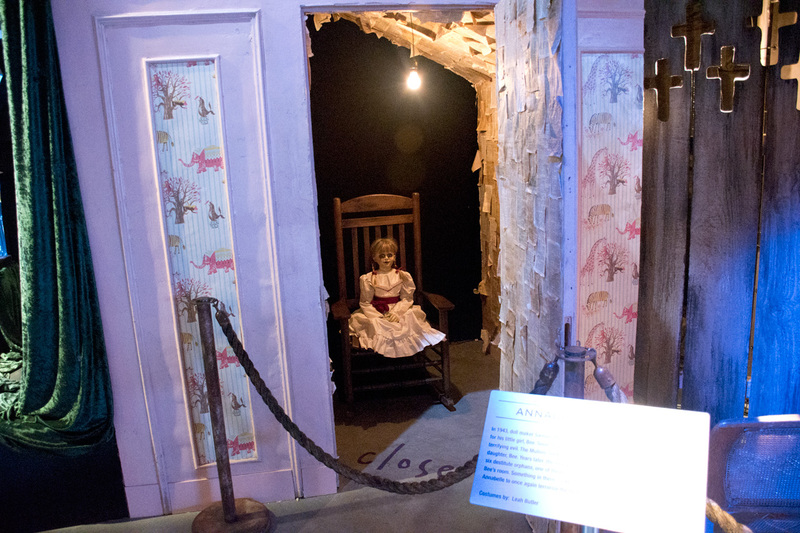 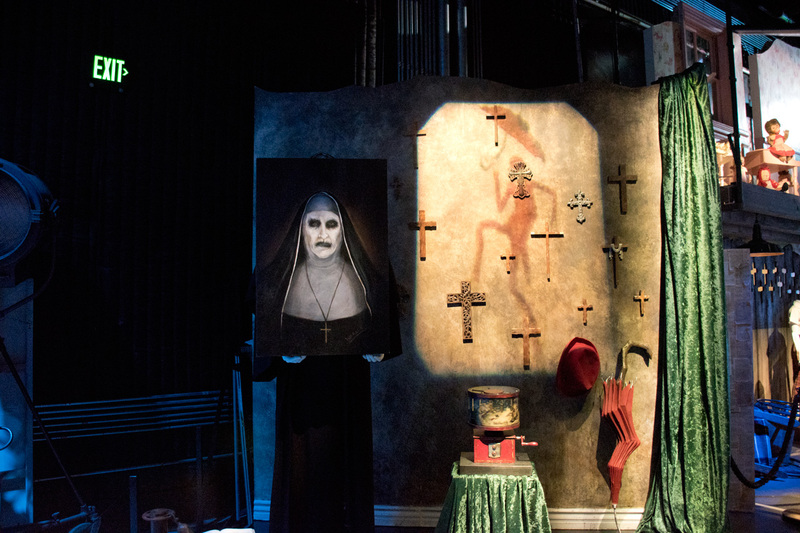 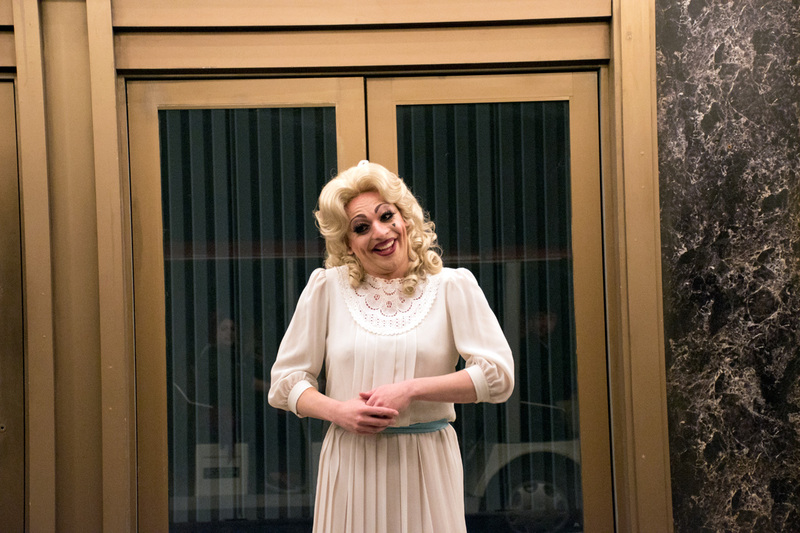 Guests enter through the garage of the home and go on a roller coaster tour through their collection of occult items. 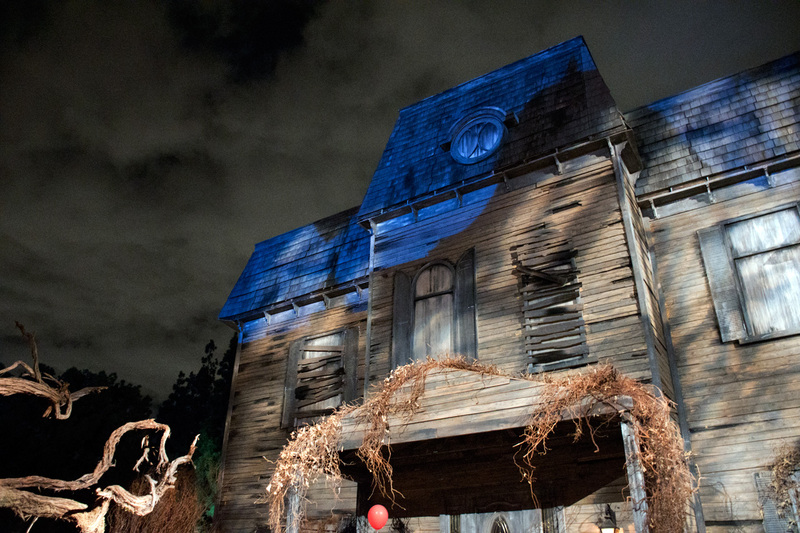 The finale of this mini-haunt is pretty spectacular and you should make sure to line up early for it. 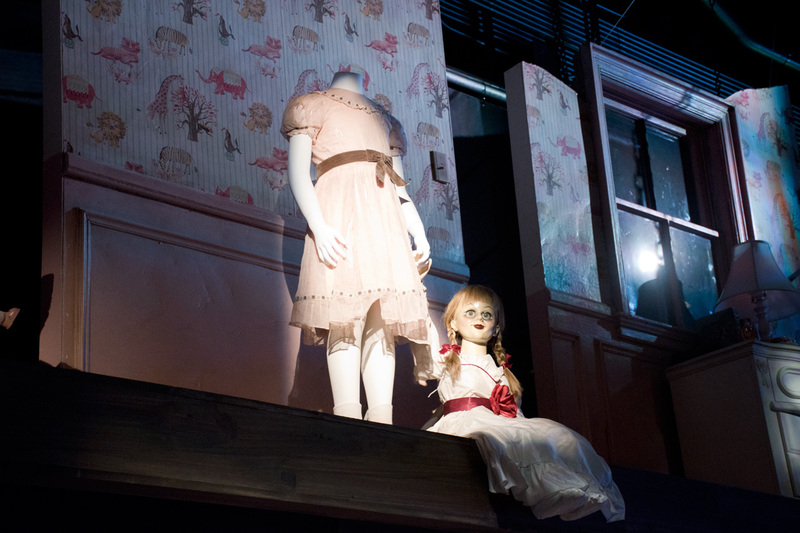 The Conjuring and IT mini-haunts had the longest lines on the night we attended. 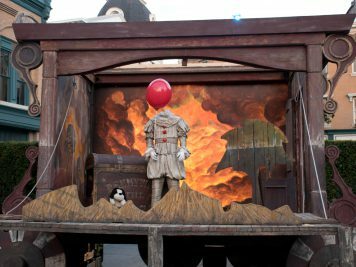 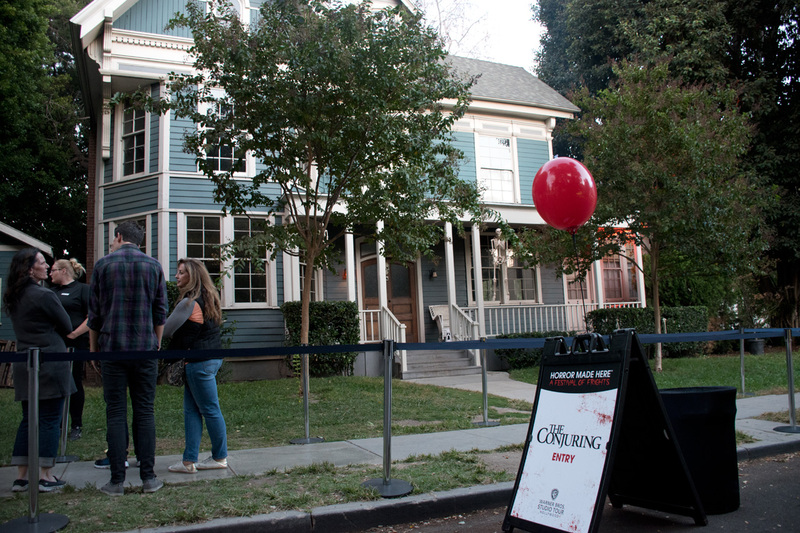 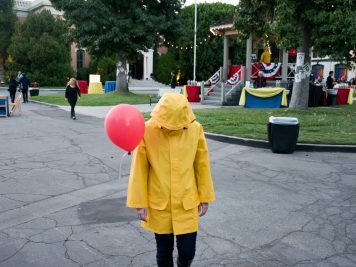 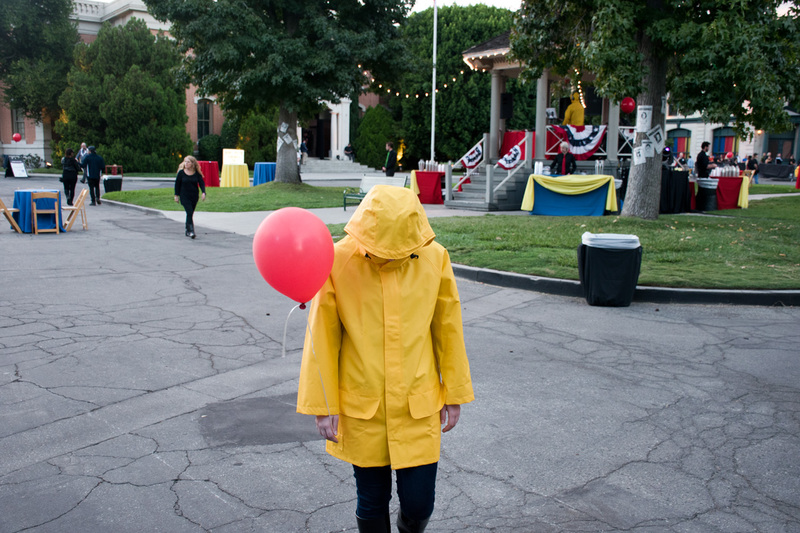 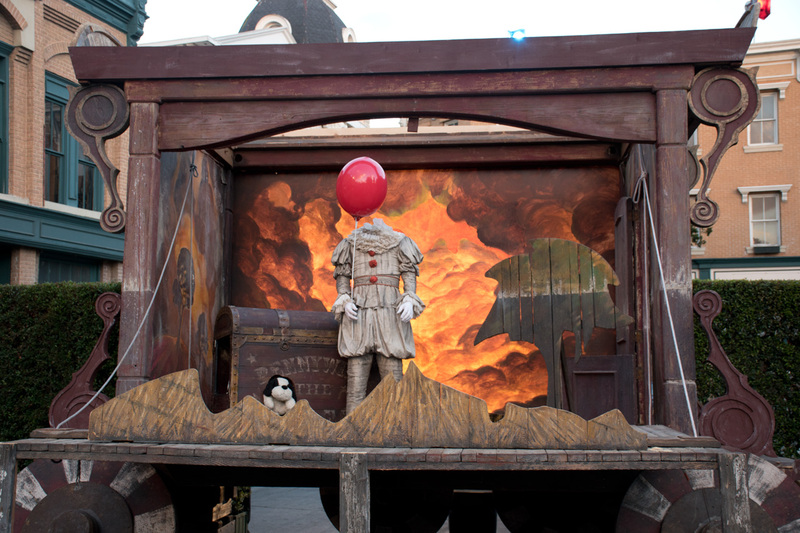 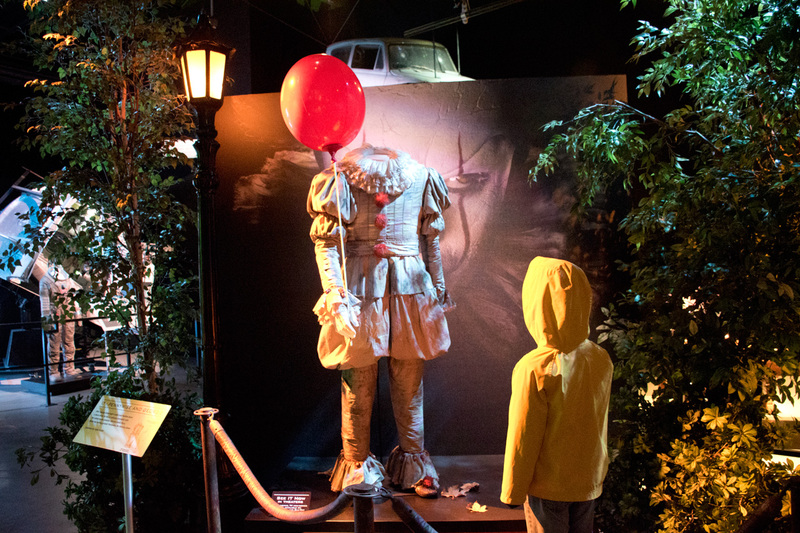 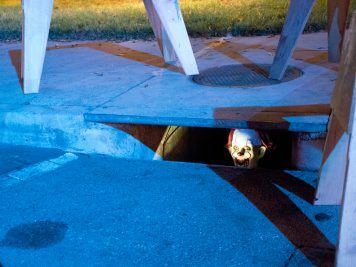 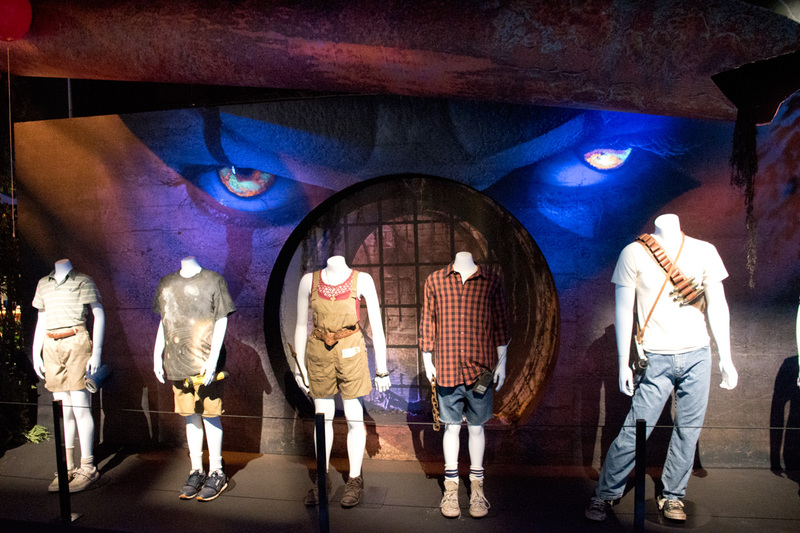 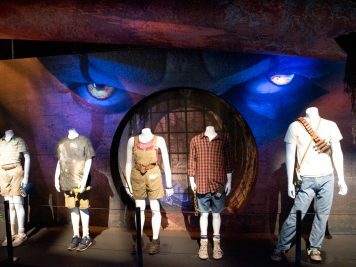 Speaking of IT, the IT Experience was moved from its Hollywood and Vine location to the Warner Bros. lot so that guests of Horror Made Here: Festival of Frights could enjoy/endure it. 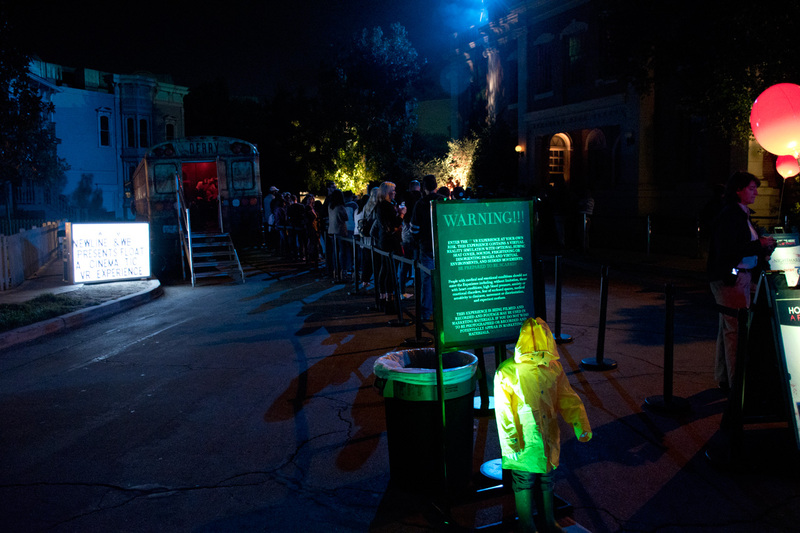 The line was fairly long but the experience was, in some ways, made better than when it was off-site thanks to some enhanced lighting design. 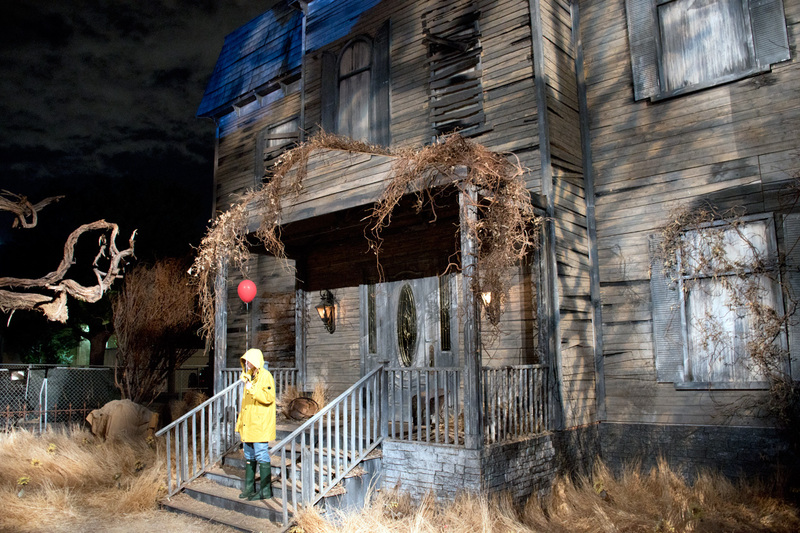 While the mini-haunts are good, they are not like normal-length haunted houses you find at most haunted attractions. 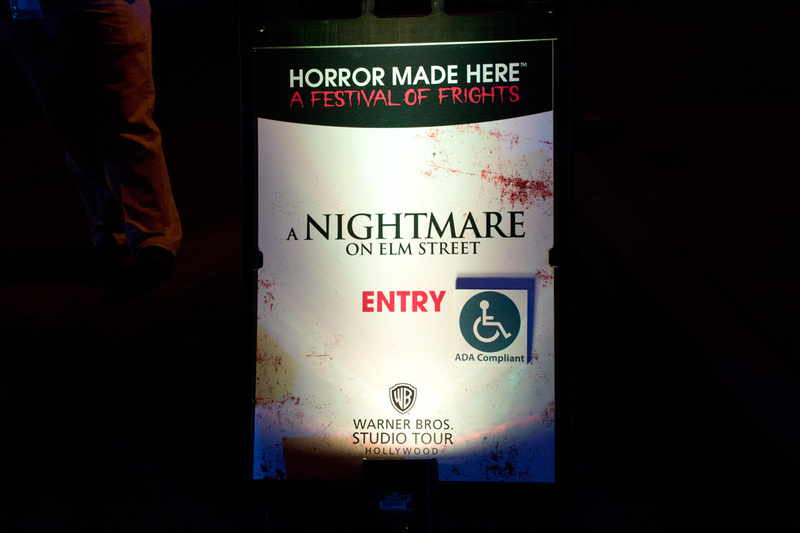 That being said, there is more to the Horror Made Here event than just the mini-haunts. 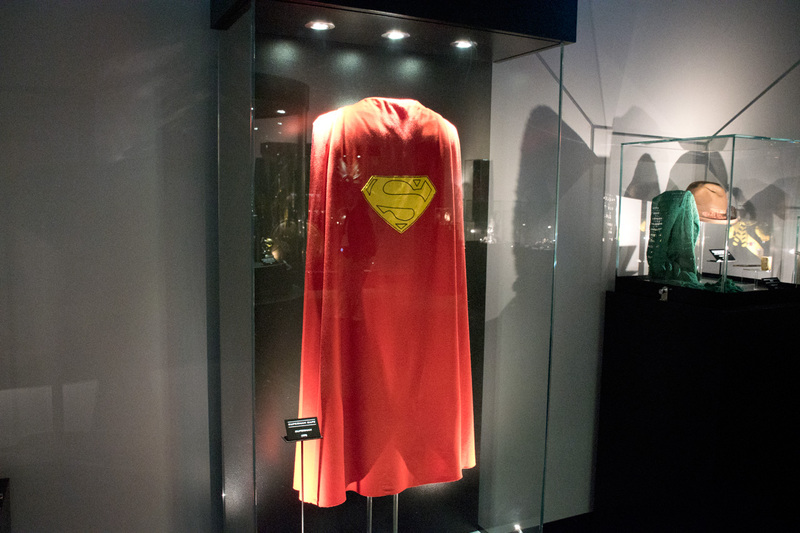 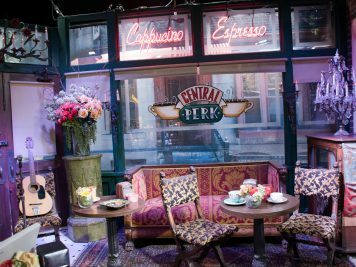 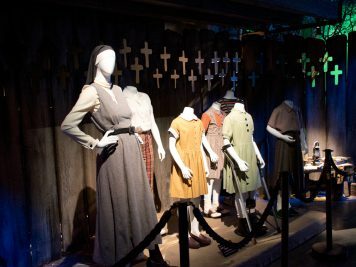 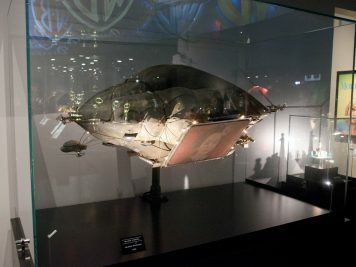 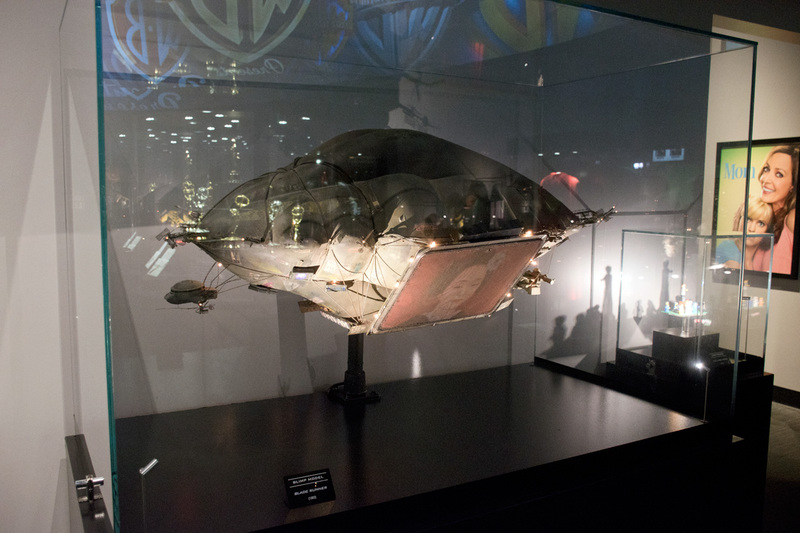 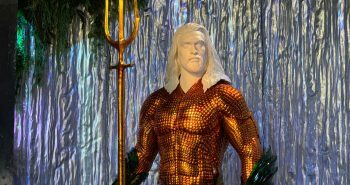 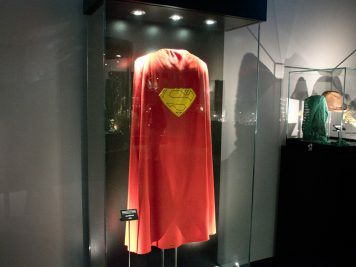 We then took time to ride the abbreviated WB Studio Tour – actually, we rode it several times, as each time we heard slightly different pieces of movie/TV info. 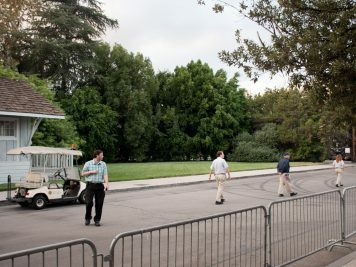 The abbreviated studio tour for the evening had a few different stopping points where scare actors would “attack” the tram, but they were fairly scattered. 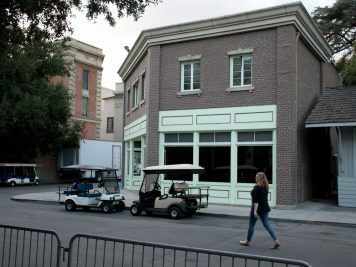 These were divided by moments when you got to hear about some movies and TV shows filmed at various points along the tour route, but the experience felt like it was unsure of itself. 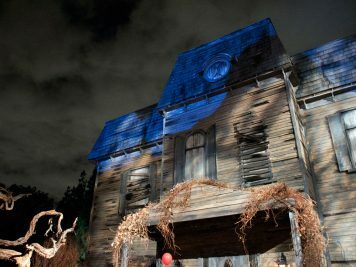 I am torn on this one as part of me would like to see the entire abbreviated tour littered with monsters and elaborate set pieces – somewhat like haunted hayrides are these days. 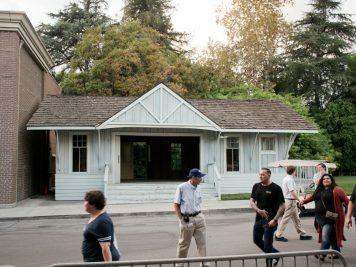 I can’t think of a haunted tram ride anywhere actually – even Universal Studios makes guests get off their trams prior to scaring them. 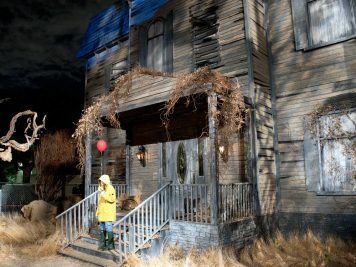 Warner Bros. could up the ante next year on this tram ride, making it a full haunted experience, if they so desired. 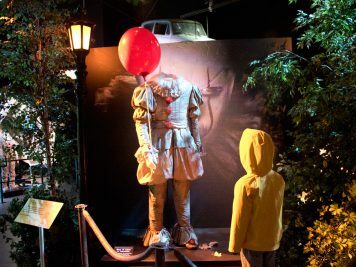 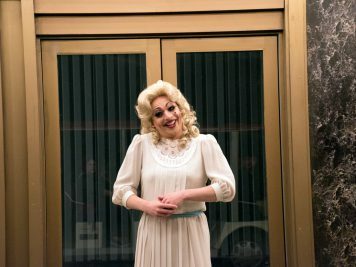 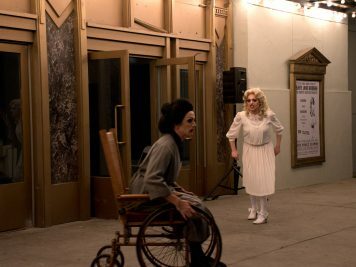 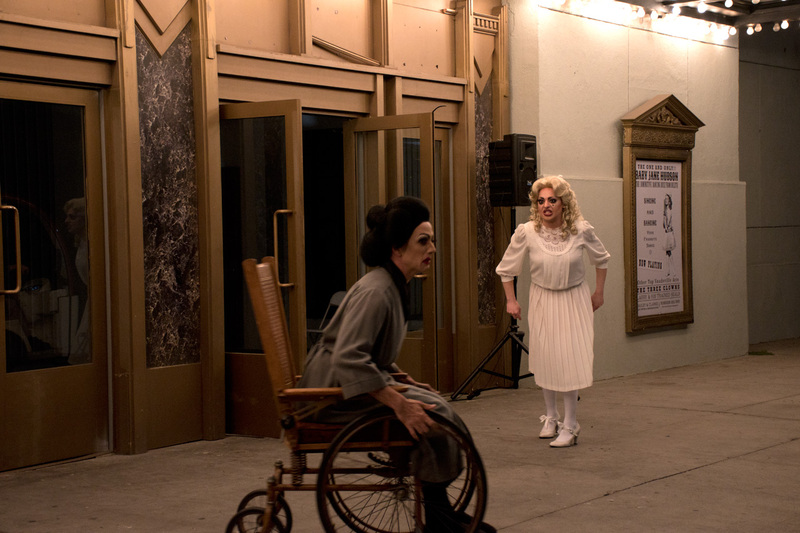 The other part of my torn self thinks that they should reverse course on the tour with regards to the horror stuff if they won’t fully commit to it, making the tour more like the day experience – talk more about the variety of films shot at places along the route. Right now it’s sort of in a weird middle-ground that didn’t work quite like it should have. 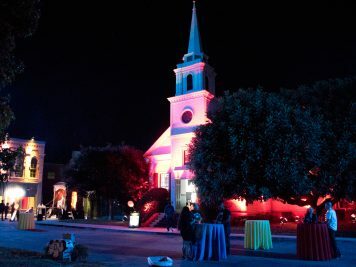 The live DJ spun a wide variety of songs and the bar tables featured a decent selection of alcohol. 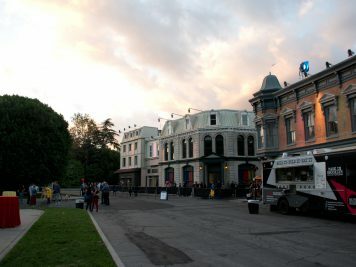 The food trucks on-site were of a wide enough variety to cover most things a person could want. 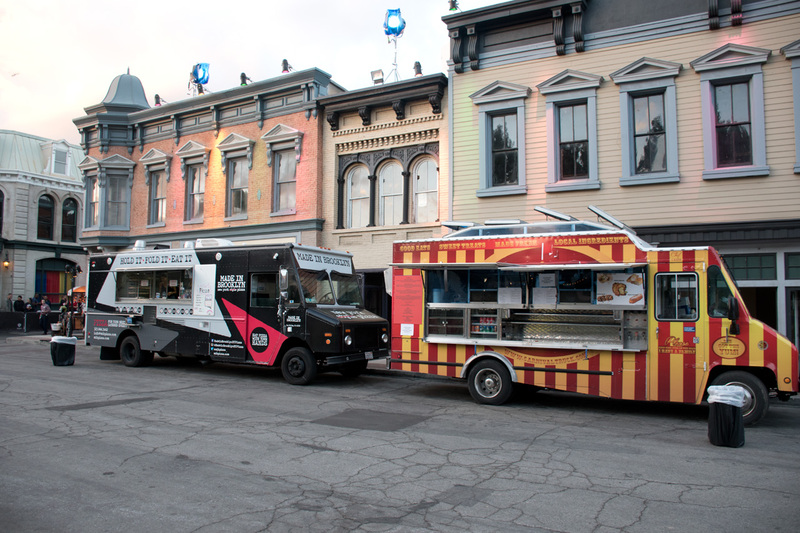 We tried out the Made in Brooklyn NY Pizza truck and I could not have been happier. 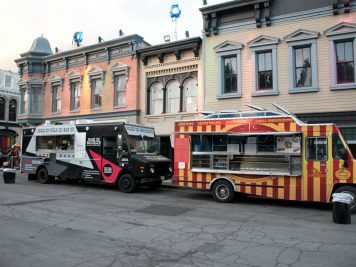 I just came back from a vacation in New York City and this pizza was the closest I have found on the West Coast to being like the ones I ate while in the city. 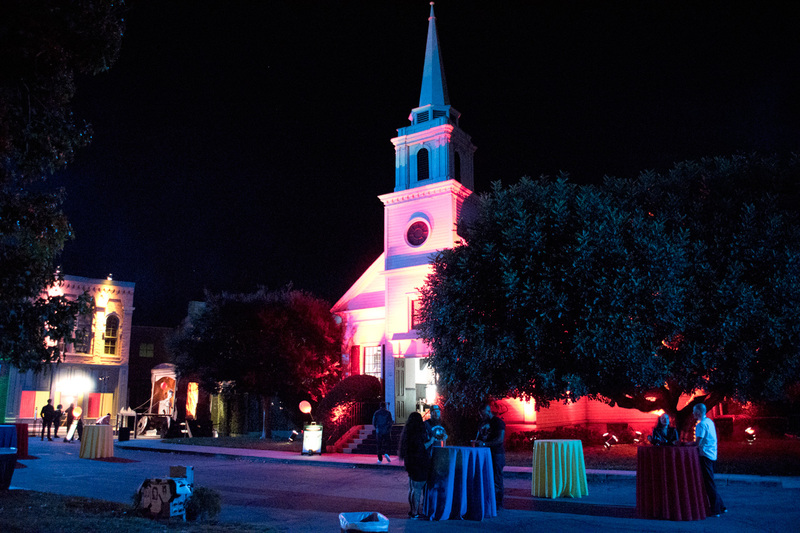 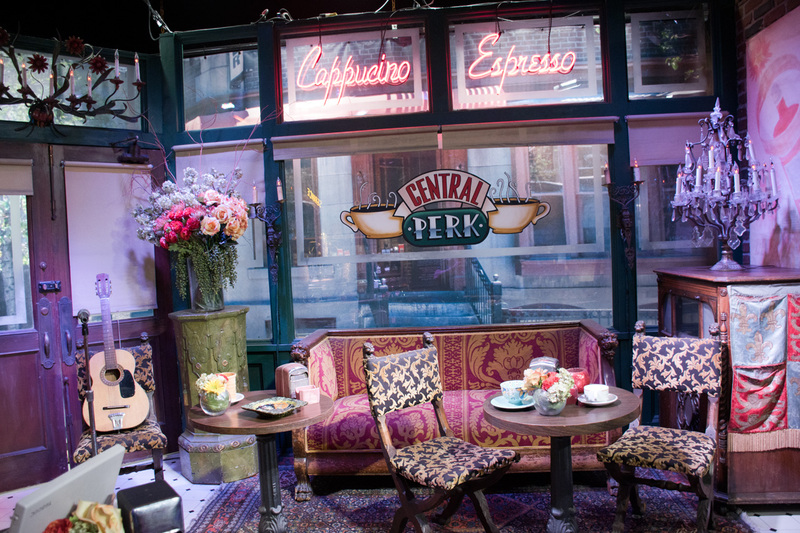 At one point, we sat down in the table and chairs located around the gazebo and just took in the sights and sounds. 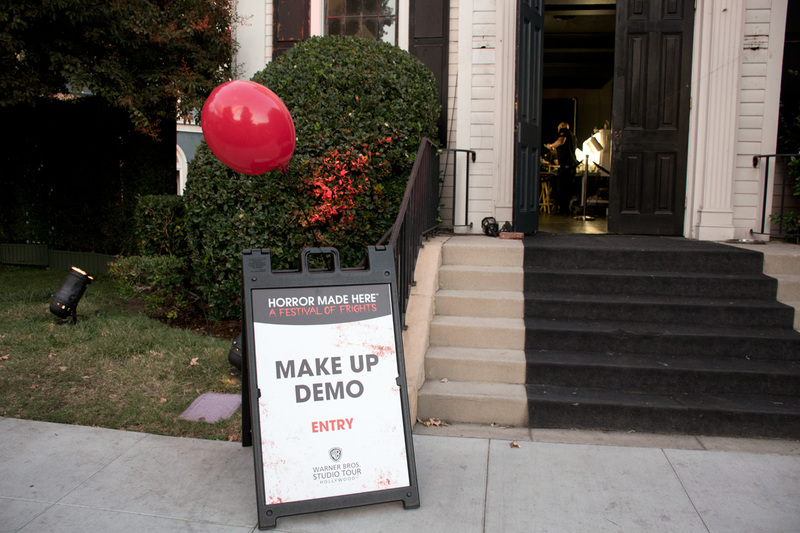 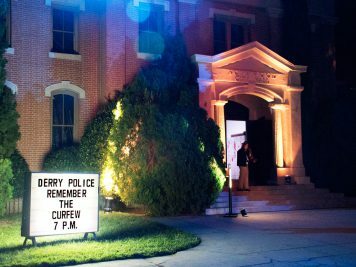 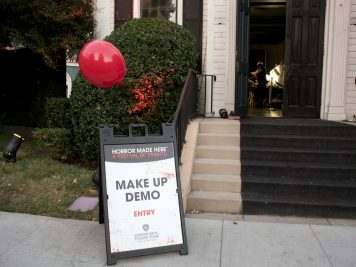 There were some scare actors working the crowd around the lot, and even a makeup demo area setup inside the church where we saw some good prosthetic work being done. 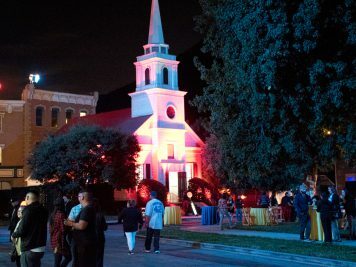 Only in its second year, I can’t help but think that Warner Bros. is putting together plans for a much larger haunted event to come. 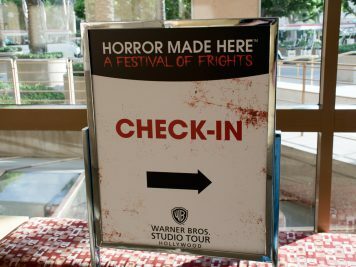 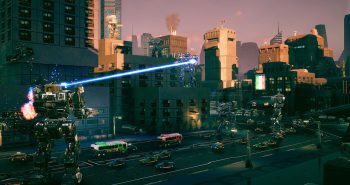 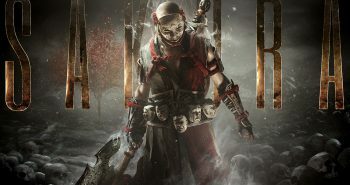 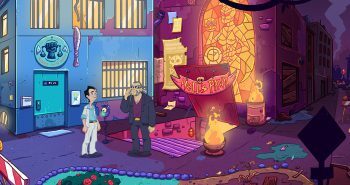 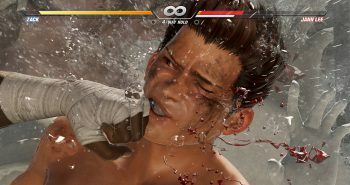 Horror Made Here: Festival of Frights feels very much like an evolving experiment so they can see what works and what doesn’t – as well as see what they can add for next time. 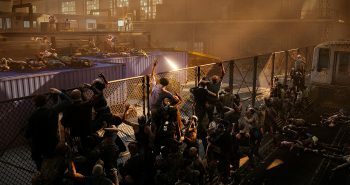 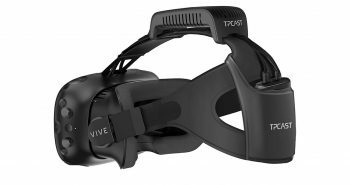 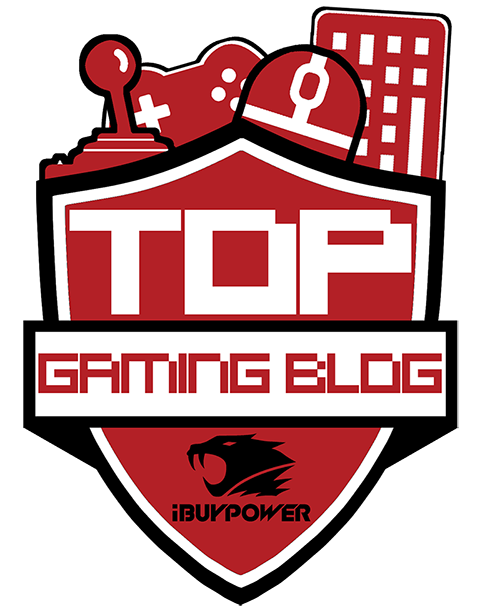 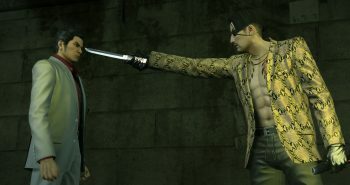 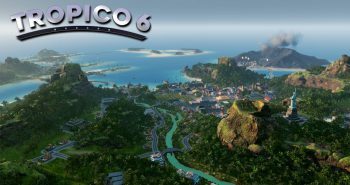 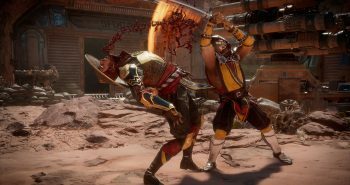 This is one event that I will certainly be waiting for in the Fall of 2018. 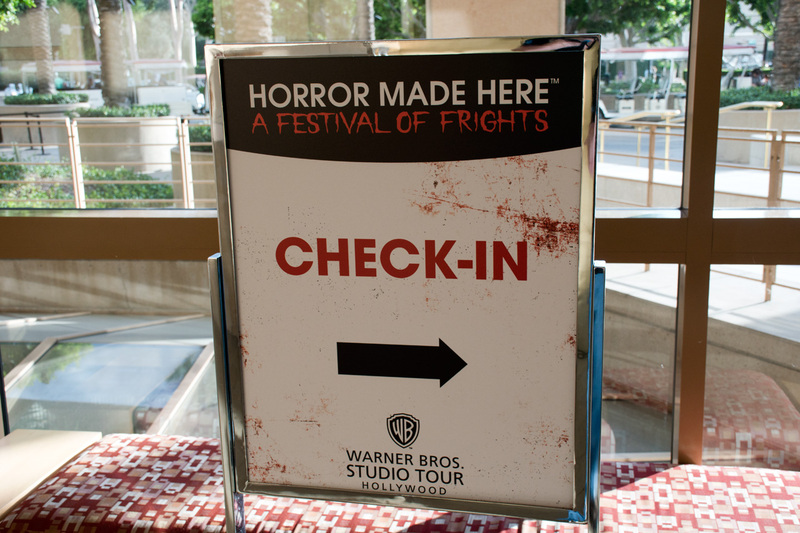 If you’d like ticket information and more for this year’s Horror Made Here, check out the official website.